Last May, Russ and Rhonda Rhoden were having a nice dinner out when she looked at her husband and said, "I can see us there." She could see them at the Otino Waa Children's Village in Uganda, Africa. She could see the dark-skinned orphaned children and teams of missionaries. "This is what God is showing me," Rhonda hold her husband. They knew that the current orphanage directors would soon be returning to their home in the United States, creating a need for in-country directors. "I said, 'I can see us doing that,' the job that they were doing," Rhonda said. Not long after Rhonda's vision, the founders of the orphanage, Oregonians Bob and Carol Higgins, called them. "They asked us if we would pray about being the next in-country directors," Russ says. While they were waiting for God to shut doors, instead, doors kept opening. So, last week, the Prineville couple hugged their children and grandchildren goodbye and boarded a plane for Lira, Uganda, where they will serve as in-country directors for Otino Waa Children's Village for at least two years. "It's a step of faith and obedience both, knowing that this is what God has for us to do," Russ said earlier this month while visiting about their upcoming mission. Uganda is similar in size to Oregon and yet has nearly 43 million people, compared to just over 4 million in Oregon. There are an estimated 2.5 million orphans in Uganda. For more than two decades, Northern Uganda was the battleground for civil war between the Ugandan government and a rebel group called the Lord's Resistance Army. In 2002, missionaries Bob and Carol Higgins, of Bend, heard of 78 orphans who were being targeted by the LRA to be abducted near the town of Lira. With the help of local leaders, they managed to rescue the 78 children and began to care for their basic needs. Throughout the year, it became evident that these children needed long-term care. In 2003, Otino Waa Children's Village was created just outside Lira. Today, there are nearly 300 children who call the orphanage their home. An additional 200 children from surrounding villages attend school there. As Uganda has stabilized since the end of the war, they no longer are fighting the LRA and child abduction but are now fighting AIDS, poverty, a broken economy, disease, unsafe water and hunger. Otino Waa leaders have sought out the most vulnerable, desolate children to take into the orphanage. They provide a safe and loving home, nutritious food, clean water, medical and dental care and primary and secondary education. The school offers vocational training in beekeeping, agriculture, mechanics, electronics, tailoring, carpentry and computers. The village also has a medical clinic, a dental clinic and two cafes. They have a scholarship fund that helps graduates continue on to higher education. Russ serves as the missions pastor at Eastside Church in Prineville. Over the years, he has led teams of missionaries to China, Nicaragua, Costa Rica and Panama. But around 2012, the Lord started speaking to the Rhodens again. "The Lord showed Rhonda and I that we have all this extra love to give — His love," Russ said. "We love our children as much as we can. We love our grandchildren, our families as much as we can. We really had this extra love, so we were praying for an outlet. 'Where else, God, would you have us go?'" He was then invited to join a missionary team headed to Otino Waa. He accepted the invitation, and in 2013, he made his first trek to the African nation. There, he helped update biographies of children who needed sponsors. "Hearing their stories in one-on-one interviews was just powerful," Russ recalls. "Seeing those kids and what they'd been through, we'll never feel their pain, we'll never know their struggle, but yet their faith in God was just unbelievable." He said he came home from the trip totally changed. "My faith grew 10-fold in that time," he said. "I started from that time taking teams to Otino Waa, and my wife was eventually part of those teams." Since that trip, he has become a board member and has taken missionary teams to the orphanage seven times. Rhonda has joined him twice. "I kept feeling like I didn't know that we would ever live there full-time, but I did feel we would be there more time," he said. They have three daughters and six grandchildren and couldn't imagine leaving their family for an extended mission trip. But the Lord was working in their hearts. So when the Higgins called to ask if they would pray about being long-term missionaries, they at first said they didn't think it would work. "I don't know," he told Bob. "We grew up here. Our roots are deep in this community with the people also with my job, but more particularly, our family." They kept praying about it, waiting for God to shut the door. "God just never shut the door. Everything just kept happening," Russ said. Things began falling into place, making it possible to leave their home, their jobs and their family and become the Otino Waa Children's Village in-country directors. It was right around Labor Day in September that they came to the decision that they were going. That's about the time Bruce Scanlon stepped in as assistant manager of Ochoco Irrigation District, where Russ has been employed for 27 years. Rhonda gave her notice where she worked at the Les Schwab headquarters and left at the end of December. They arranged for some family members to rent their home. They are promised a few visits home during their mission, so they won't have to miss milestones in their children's and grandchildren's lives. In 2018, Otino Waa leaders initiated a second branch called Otino Waa Community Based Care for Orphaned and Vulnerable Children. 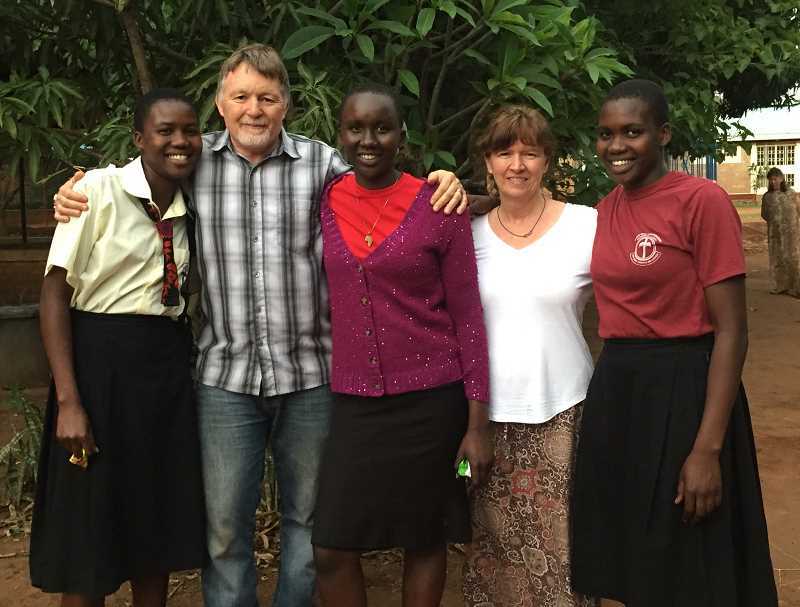 "Community based care is a way that we can go right into the local communities, connect them with the local church, and seeing what we can do to help take care of orphans and vulnerable children right in their village setting," Russ explained. The types of children and families who fit into a community based model include children who may have a living relative who is willing and physically capable of caring for the children but who needs assistance with basic necessities like food, clothing and education. By sponsoring these children to go to school and providing basic food or medical assistance, they are able to lift a burden off the family. As in-country directors, the Rhodens will live in nearby Lira and provide oversight to the ministry, which is mostly run by the indigenous people. "We're just going over as part of the body of Christ, to come alongside them, to encourage them," Russ said, adding that they will also conduct an overall assessment of the programs. While helping run the village, the missionaries will also share the Word of God with the students and surrounding villages. "I'm really praying and hoping that we have the opportunity to grow the church, to advance God's kingdom, to plant churches," Russ said. "The number one thing is it's a Christ-centered ministry, and really, our one goal is that it remains a Christ-centered ministry." They were looking forward to seeing their three Ugandan daughters that they have sponsored for a few years as well as other children and friends. "I'm looking forward to just loving on the kids and making them feel loved," Rhonda said, adding that she will also enjoy working with her husband every day. The Rhodens say they are thankful for the support of their family, friends, community and Eastside church. Although they are planning on a two-year mission, they are openhanded if the Lord calls them to be there longer. "The disciples asked Jesus what the most important things were, and he said, 'One, that you love God with all your heart, soul, mind and spirit, and the second is that you love your neighbor as yourself,'" Russ said. "We want to make sure we do those things really, really well."